We will only provide free technical support if you have purchased either the "Direct" or "Assisted" installation service. Important: Installing WS.WebTV in a folder of a WordPress blog, or any other CMS? Keep in mind that if you install WS.WebTV in a folder of a Website which already has a CMS installed in its root, you must make sure that any "mod_rewrite" (URL redirection) will not affect the WebTV folder, otherwise WS.WebTV will not work correctly. First, create a temporary folder in your local drive, with the name (for example) "webtv-files". - Download the base package file. NOTE: The license agreemen can be found in webtv-files/www/_acuerdo_de_licencia (in Spanish) and webtv-files/www/_license_agreement (in English). If you have purchased extensions, some of them may require downloading a ZIP file. - Download the file corresponding to each extension. - Open each ZIP with the corresponding password. 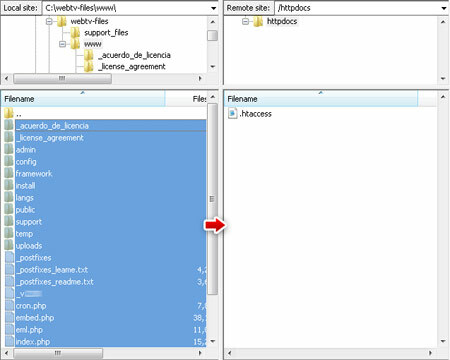 - Just like the base package, inside each ZIP file you'll find a "www" folder which contains the extension files. Copy the folder "www" inside the "webtv-files" folder you previously created (confirm file overwrite when the operating system asks). The result is that the files of the extension will add to (or overwrite) those of the base package. If there is any postfixes package available, download it and unzip it inside the "www" folder of "webtv-files", in other words, inside "webtv-files/www" (confirm file overwrite when the operating system asks. Use a FTP program (like FileZilla ) to copy all the files and folders located inside "webtv-files/www", into your Web server's destination folder (do not copy the "www" folder!). Note: If you are on Mac, beware of Cyberduck as some users have reported file permission issues with the files copied to the server. We recommend using FileZilla instead. Then create/assign the corresponding database's user enabling all available privileges. 2. Read carefully all the information and instructions. 3. 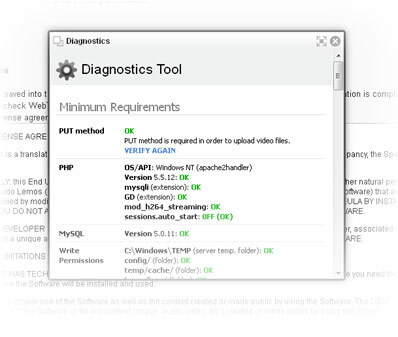 Don't forget to run the Diagnostic tool. The Diagnostic tool is useful to determine if your server meets the minimun requirements and to get information about other PHP settings. In particular, it is very important that you configure the PHP settings detailed below, according to your needs. - Setting adjustments are normally done in your server's .user.ini, php.ini or .htaccess file (some times you will need to create the appropriate file). In case of doubt consult with your hosting company or server administrator. - Some hosting companies (depending on the hosting plan) may limit the maximum values or even not allow to change them at all. Again, in case of doubt consult with your hosting company or server administrator. - These settings not only affect WS.WebTV, they also afftect ANY other PHP application that deals with file uploads or with process which require long execution times. To prevent that any execution error be visible to the WebTV visitors, set it to "Off" (recommended). NOTE: There are also several other configuration option in your Web server configuration which could cause issues with the upload of large files. Please read the "TROUBLESHOOTING" section at the bottom of the page for more information. 4. Click "I accept, Start" when ready. Enter the appropriate database info. Then click Continue. 5. Once the database is installed, the next step is to supply the license key and the basic configuration information. Base URL must match exactly the URL you provided when you filled in the purchase form. In case your server is not able to send mails using the PHP mail sending functionality (WebTV default), you can configure the WebTV to use a SMTP account instead. For more info read the "TROUBLESHOOTING" section of this document. This option has been removed from the installer since WS.WebTV 2.4. Since this version, the master password must be set from the Configuration > General section of the Content Administrator. • (Since WS.WebTV 2.4) In the config/ folder, it must have been generated a file with random name and .pek extension. "pek" means "partial encryption key"; it is "partial" because its content is used, along other information, as key to encrypt data before being stored into the database and to decrypt data which have been stored encrypted in the database. This file is unique for each WebTV and if it get lost or damaged it won't be possible to decrypt data which is stored encrypted in the database. • We strongly recommend you to make periodic backups. Read the tutorial here. 7. Logging in for the first time. Without leaving the previous screen, click on "Log In" to access the Content Administration Interface. NOTE: You can also log into your WebTV by visiting: http://your_webtv_url/admin. When you purchase extensions, besides copying the corresponding files to the server, it will be necessary to enter a new license key. In order to do this, go to Go to Configuration > General Tab. Enter the license key into the appropriate field. 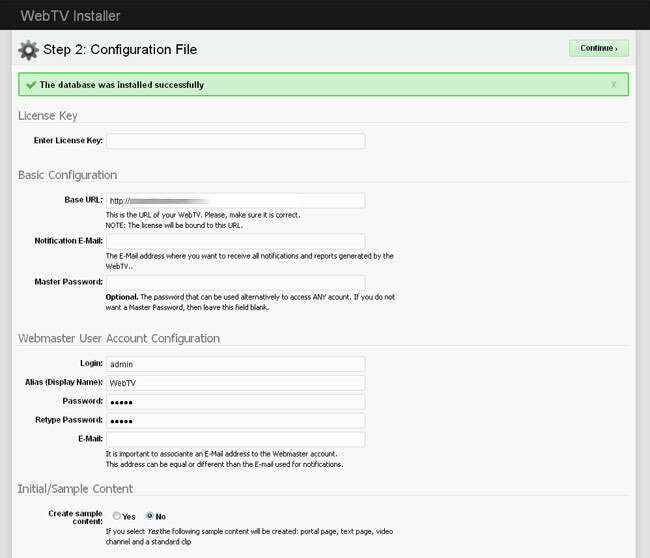 Then Save the Configuration. NOTE: The robots.txt will only work when it is in the root of a domain. If your WebTV is installed inside of a folder, it will be ignored by the search engines. If your server includes FFmpeg support, you can configure WS.WebTV to compress videos. Check the following video encoding configuration tutorial for more information. If your WebTV is installed inside a folder of the domain, the file will be ignored by search engines; in this case, you must include the directives corresponding to your WebTV inside the robots.txt file which is in the domain root. The "standard" style should work on any server. $FRIENDLY_URLS_ENABLED = true; // Ops: true / false. Enable/disable Friendly URLS. $FRIENDLY_URLS_STYLE = "default"; // Ops: "default" / "folder" / "file"
Please, note that "folder" and "file" styles require the mod_rewrite Apache module, and .htaccess file modification. 1.1) Check your PHP settings and adjust accordingly. 1.2) If your server is based on Apache, check if mod_security is installed; if so, try disabling it (we have found this mod to be responsible for many file upload issues). 1.3) If your server is running PHP as FastCGI, see below. 1.4) Make sure the server's temporary folder does not have size restriction. 2.1) Check the uploads/movies folder write permissions. 2.2) Make sure the PUT method/verb is enabled in your server. 2.3) Make sure the server's temporary folder is writable. 2.4) Make sure the server's temporary folder does not have size restriction. 1) If uploads interrupt: Check your PHP settings and adjust accordingly. 2.1) Check the uploads/images folder write permissions. 2.2) Make sure the PHP GD extension is installed. • Apache: Most Apache-based servers have the "PUT" method enabled; however, if your server has this method disabled you should be able to enable it from the .htaccess file. • IIS (Internet Information Services): If your server does not have the PUT verb/method disabled you will need to modify the applicationHost.config file (look for the appropriate <location path ...> block): 1. Remove WebDAV module 2. Add PUT verb to the <handlers> section. • CGI/FastCGI: If your server is running PHP as FastCGI and after changing the upload/post size limits you find your server is ignoring them; try configuring it to run PHP as "Apache module" or "DSO"; this can be accomplished fairly easily on servers with Plesk or cPanel (as long as the server allows to change the aforementioned setting). If you want to stay with FastCGI and your server has the mod_fcgid then it is very likely you need to increase the MaxRequestLen value. • Plesk Web Application Firewall: If you have problems uploading big files and in the "Web Application Firewall" error log you find entries like "ModSecurity: Request body (Content-Length) is larger than the configured limit (...)" then you'll need to disable the specific directive or fully disable the "Web Application Firewall". • IIS (Internet Information Services): If youser server is ignoring the PHP upload limits, you will need to modify the requestLimits maxAllowedContentLength setting (applicationHost.config file) to match the PHP setting upload_max_filesize/post_max_size. 1. If your database connection host is "localhost", use 127.0.0.1 instead. 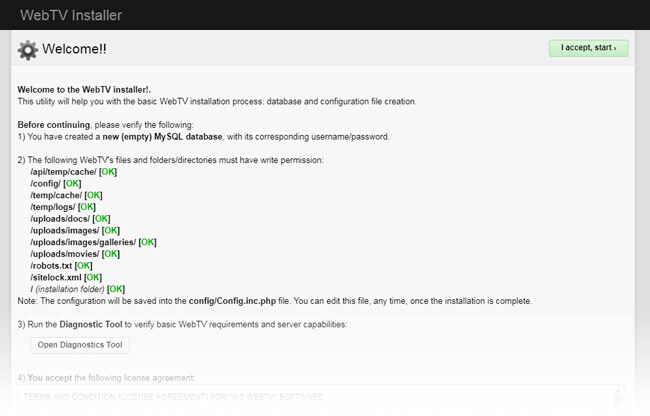 If the WebTV is already installed, modify the databse host in the WebTV configuration file (config/Config.inc.php). Related Article/Post. This is to force UTF-8 encoding. By default, the WebTV uses the PHP mail() function; however if the function is disabled or incorreclty configured in the server then the WebTV won't be able to send mails. $NOTIFICATION_EMAIL = "notification_email"; // The E-Mail address where the website will send notifications (if any). $SEND_MAIL_USING_SMTP = true; // Ops: true/false. If set to false, the Website will use the native PHP mail() function. If you are having problems with this method, or it is not available/enabled in for server, set it to true and configure the SMTP values.